Wow, spring is in the air in Baltimore, and it feels good. I don’t know about you, but I definitely had a case of the winter blues. It’s so nice to finally see the sun and feel its warmth on my ghostly white skin. Seriously, my skin is so white that it glows- and not in a good way. 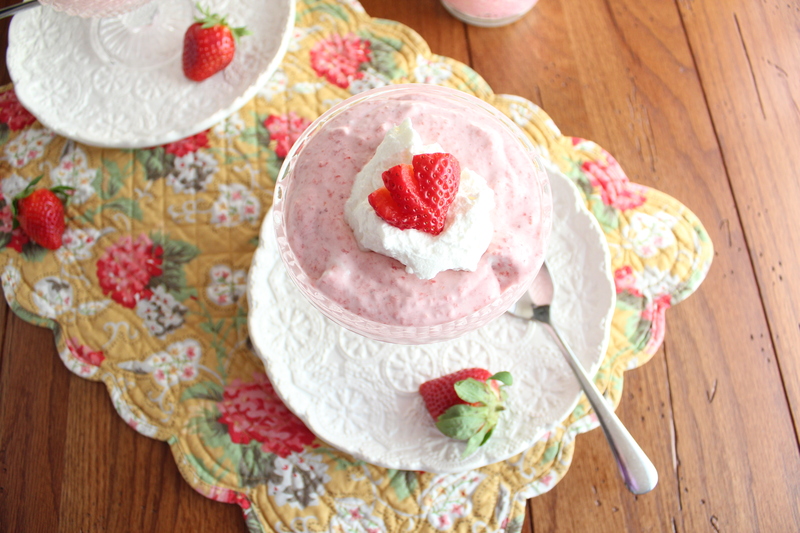 In honor of spring, I made a lovely light and airy strawberry orange mousse. It’s sure to pull you out of your winter stupor. 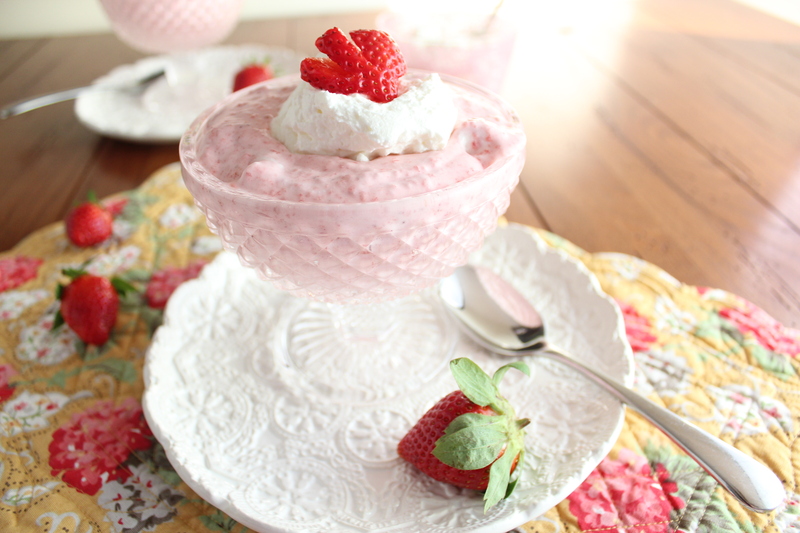 This creamy dessert is easy to make- like, super easy! It will appear as if you spent all day in the kitchen making it, when actually, it only takes about 10 minutes to throw together. This mousse is a nice finish to a heavy meal. Add a little white wine to the mix and you’ve got yourself a party. Strawberry and orange mingle and fall in love, creating a perfect marriage of flavors. This mousse is creamy and dreamy. It’s not too sweet, but just sweet enough to satisfy your sweet tooth after dinner. Look at those pillowy waves of strawberry and orange fluffiness. Makes you want to dive right in. Enjoy! In a blender or a food processor, blend strawberries, orange zest, and orange juice until smooth. Transfer the mixture to a medium saucepan and cook over medium heat until bubbling and just thickened, about 7-10 minutes. Refrigerate mixture until completely cool, about 2-3 hours. In a bowl of a mixture, beat cream with powdered sugar and orange liqueur until stiff peaks form. Fold the whipped cream into the strawberry mixture. Chill for about 30 minutes until mixture sets. 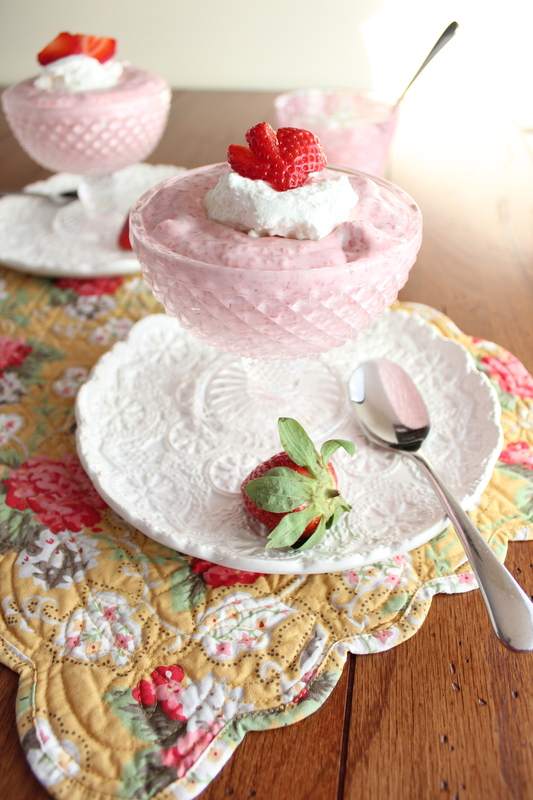 Serve with a dollop of whipped cream and sliced strawberries. Enjoy! So pretty! I am sure it is as tasty as it looks. Thanks for sharing. Thanks for the kind words, Rene. It was so good. Perfect for the season! And this plate looks so elegant and pretty! Thanks, Villy. The plates are from Home Goods. Love that place! MMmm strawberries & orange sounds like a great combo! This looks absolutely delicious! I’m with ya on the winter blues, couldn’t wait for some sunshine and warm air! Perfect Spring flavors! your photos are fantastic!! and this dessert sounds heavenly, i love this combination of strawberry and orange, so creative! Thanks for the lovely comments, Jenn. Thanks so much. Let me know how you like it. orange and strawberry mouse sounds refreshing, I’m thinking in the middle of white cake yum! But all on it’s own looks good too. Thanks, Suzanne. It would be excellent in between layers of cake. Good idea! Thank you so much. The place mat is from an Amish shop in PA.
It’s warm and sunny here and this would be a perfect dessert for me now! Oooh, yum! That looks so elegant and refreshing. Wonderful creation! Eat your heart out, Martha Stewart! This mousse looks FABULOUS! I am a big mousse fan, and I adore strawberries – but I’ve never tried to combine that w/ orange. It sounds more than intriguing! Hat’s off! Thanks so much. I love experimenting with flavor combos, and this one was a success. Gotta love it when that happens. Thanks for visiting. Strawberries with orange is a delightful combination. The mousse looks delish. Yum, my 2 favorite flavors combined into a delicious mousse that will the perfect dessert for my dinner gusts.